Simply put, this concept essentially means that individual colleges look for certain characteristics in applicants. These foundational qualities might be things such as minimum test scores, demonstrated success in challenging coursework, or involvement in extracurricular activities. The authors claim that 80% of all applicants to a given college will meet certain basic guidelines, which might also be described as necessary but not sufficient for acceptance. Because colleges desire a well-rounded entering “class,” not just well rounded “individuals,” successful applicants “spike” enough in at least one area, giving them an advantage over other aspiring candidates. The book can be read in its entirety or utilized as a resource for specific information. It provides a solid philosophical basis for its recommendations while at the same time including specific advice and checklists that are easily accessible for laymen. Also included are case studies to illustrate the concepts described in each of the main chapters. Appendices offer strategies for preparing a timeline, handling waitlists or deferral situations, as well as additional resources for interested parties. Various cartoons effectively add humor to the mix. As the philosophy of “Be Alike but Spike” is examined, specific topics addressed are what one might expect: college visits, essays, letters of recommendation, financial aid, etc. However, the information is essential and any high school counselor or college-bound high school student should know it. This book is a wonderful and easily accessible tool that serves a valuable purpose, as most do not. 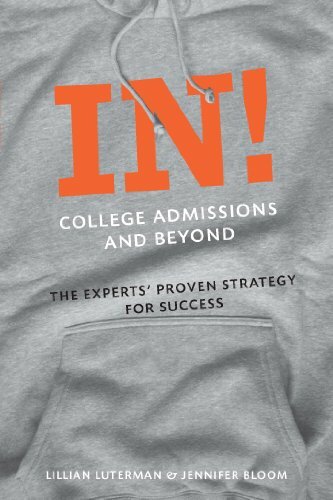 College admission is too often a game played by insiders who are the only ones who know the rules. This book helps break down those barriers. Some examples of advice that might not be otherwise obvious, especially to parents who are dealing with the process for the first time or who themselves did not go to college, include “Layering,” which means that school activities should not be the only thing emphasized on the application. To truly spike, a person who describes their love of history, should look for opportunities outside of school to separate him or herself, such as volunteering for a museum. Another example is not to sacrifice academic courses for electives and to realize that though not everything, standardized test scores are critical, since they weigh heavily in most admissions decisions and there will be ample applicants who have all of the same qualities and high test scores. A third example is the fact that Advanced Placement courses are highly regarded by decision-makers. There are few weaknesses in the book’s actual information or the presentation of it. However, one thing should be noted. The authors reside on the East coast where the SAT (Scholastic Aptitude Test) is the more commonly preferred admissions test. The ACT (American College Testing Program) has been gaining in notoriety and has been adopted as the required high school test in many states. Additionally, it has long been the accepted test by colleges in Midwest. With the rising popularity of the EPAS (Educational Planning and Assessment System) testing system, which included the EXPLORE in eighth grade and the PLAN for sophomores as precursors to the ACT, the authors should have gone into greater detail or given this test more prominent treatment. Otherwise, a very useful tool for the college-bound.